We know that Adobe PDF is hard to edit, copy or share if you doesn't have a professional tool like Adobe Acrobat Pro, right? Then if you want to edit or share PDF anywhere without Adobe Acrobat, you may need this Coolmuster PDF Converter Pro for Mac. 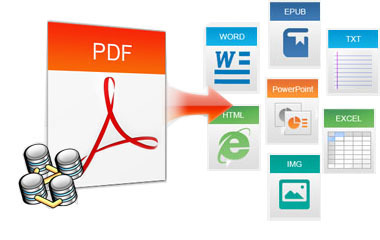 Convert native PDF to Word, ePub, Images, Text, HTML webpages, Excel, PPT and more. Support batch and partial conversion modes. Preview any files you want before converting. 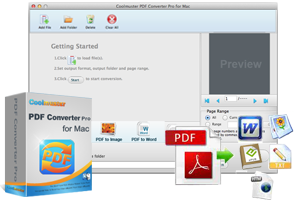 Why Choose Mac PDF Converter Pro Program? In the daily life and work, we have to deal with all kinds of files, and sometimes you may need to change the file format from one to another for better editing and sharing. Under this situation, a professional yet easy-to-use PDF Converter program could be an ideal tool to help you convert PDF to different file formats. 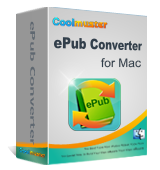 Coolmuster PDF Converter Pro for Mac is a must-have application that allows you to convert PDF to Word, EPUB, HTML, Text, Excel, PowerPoint and Image while keeping the original text, layout, number, hyperlink, etc. With it, you can freely and instantly edit and share PDF files anytime anywhere as you like. There are so many file formats existing on the Internet. 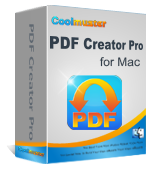 Coolmuster PDF Converter Pro for Mac has choosed several the most common used files as the output formats for your reference. Easily and quickly convert PDF to Word (.docx), ePub, Image (.jpg, .bmp, .png, . gif, .tiff, etc. ), Text (.txt), HTML (.html, .htm), Excel (xlsx), PowerPoint (PPTX), etc. All attributes of the document are precisely preserved, including all original text, images, graphics, tables, hyperlinks, layout and formatting. After conversion, you can edit and share PDF as you like. 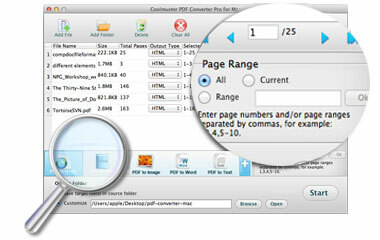 Don't want to convert a 200-page PDF file on Mac at one conversion? 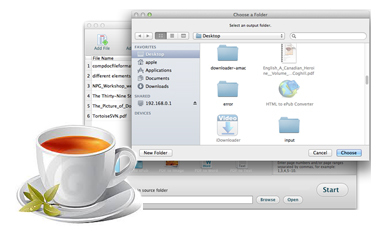 Want to export up to 20 PDF files at one time? Don't worry, you can do it with this powerful Mac PDF Converter Pro. Batch Conversion Mode: You can convert up to 200 PDF files at a time to save time. Partial Conversion Mode: You can also only convert the wanted pages or page ranges to the format you want by setting the page ranges. In order to help you get more info of the PDF file you want to convert, this tool enables you to preview any PDF files in its built-in viewer before converting. Performs well as a handy PDF Viewer. You can view any PDF files in the tool without the help of Adobe Acrobat. Double click the file you want to preview, then you can view it in the right panel. All software here is no spyware, no adware and no viruses. Just download and use it without any doubt.